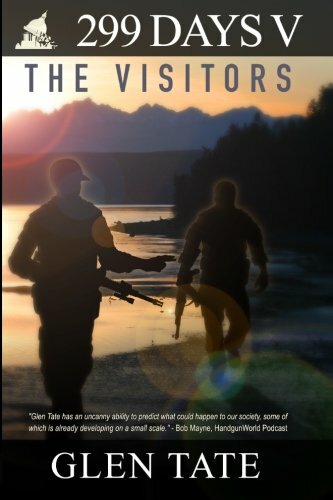 299 Days: The Visitors, the fifth book in the 299 Days series, follows Grant Matson, the Team, and other Pierce Point residents as they adjust to a rapidly changing post-Collapse reality. When the Team is summoned to bust a meth lab and protect their neighbors, they find themselves in an intense crime scene that results in the community having to decide innocence, guilt and punishment. Adjusting to this “new normal” is a challenge to Grant and others as they navigate a world where Pop-Tarts cost $45 a box, neighbors die from easily preventable conditions, and what remains of the former U.S. Government is deliberately choosing who they will and will not help. As tensions grow in Pierce Point and the Team begins to face organized opposition, they are presented with an incredible opportunity by the arrival of Special Forces Ted and his game-changing proposal. Grant finds himself at a crossroads as he must decide whether he and the Team will formally join the Patriots and train to become guerilla fighters against the growing forces of the Loyalists or standby and watch events unfold. Grant knows one decision could risk his marriage and family, while another would mean letting others decide their fate.